Zoologists from Trinity College, Dublin have located a previously unknown bird species living in Sulawesi, Indonesia. 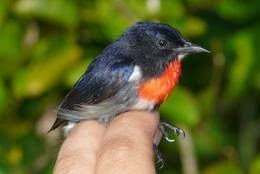 Named the "Wakatobi flowerpecker" (Dicaeum kuehni) [photo] It is found only on a small island chain in southeast Sulawesi and is genetically distinct from the grey-sided flowerpecker living on the mainland. Genetic analysis indicates the two species have not interbred separated as they are by 27kms of sea. Sulawesi is a genetic hotspot explored by Darwin's lesser known colleague, Alfred Russell Wallace, who wrote one of the best accounts of scientific exploration in his journal, The Malay Archipelago. The region is understudied probably because of its remoteness, so their could be more biological surprises awaiting naturalists. The Wakatobi islands are within the boundaries of the Wakatobi Marine National Park, but they currently receive no legal protection. With the discovery of the unique bird, the archipelago's conservation status will need to be reassessed. Each of the four large islands is inhabited by different number and variety of species. For example the Wangi-wangi white-eye lives only on the island of Wangi-wangi despite satellite islands lying only a kilometer from the shore. 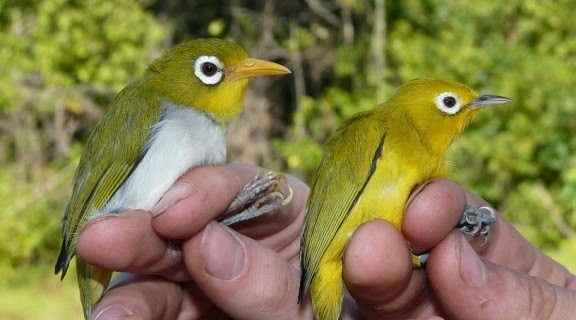 The Wakatobi white-eye lives on Wangi-wangi and its islets; it has a different shaped beak. All the white-eyes living on the archipelago's four large islands differ morphologically [photo]. The study authors, whose paper was published in Plos One, ask for more detailed surveys to be carried out before tourist development irretrievably alters the environment. It could be the case that human activity is accelerating species differentiation in Wakatobi, contrary to the effect of development found elsewhere.